Candler School of Theology is spearheading a three-city tour addressing the death penalty, featuring noted author and activist Shane Claiborne, author of "Executing Grace: How the Death Penalty Killed Jesus and Why It’s Killing Us." Photo courtesy HarperCollins Publishers. 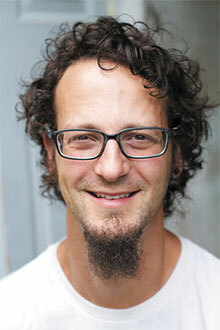 Candler School of Theology’s James T. and Berta R. Laney Legacy in Moral Leadership and the school’s Social Concerns Network are spearheading a three-city tour to discuss the death penalty, featuring noted author and activist Shane Claiborne. “Executing Grace in Georgia: A Faithful Discussion About the Death Penalty” will explore how people of faith and conscience can change the conversation about justice, mercy and forgiveness in the state, which executed nine inmates in 2016, more than any other state in the nation. Claiborne will appear Feb. 3-4 in Atlanta, Athens and Macon. Claiborne will speak at Glenn Memorial United Methodist Church on Emory’s campus at 7 p.m. Friday, Feb. 3. On Saturday, Feb. 4, he will present at Covenant Presbyterian Church in Athens at 10:30 a.m. and at Centenary Church in Macon at 6 p.m.
Local guests, including former inmates, family members and legislative advocates, also will speak at each gathering. All three events are free and open to the public, but registration is required to ensure seating. Register here for any of the three events. The discussion is based on Claiborne’s latest book, “Executing Grace: How the Death Penalty Killed Jesus and Why It’s Killing Us” (HarperOne, 2016). In it, he unpacks the issue of the death penalty through biblical analysis, church history and narrative storytelling, challenging Christians and non-Christians alike to abandon the death penalty once and for all, and adopt a plan of true justice. Robert M. Franklin Jr., James T. and Berta R. Laney Professor in Moral Leadership, says that the current political climate in the U.S. and around the world underscores the critical nature of the conversation and of Claiborne’s leadership. Claiborne serves as co-director of Red Letter Christians, a movement of Christians committed to living out the lifestyle prescribed in the Gospels. He’s also the founder of The Simple Way, a faith community in inner-city Philadelphia that has helped to birth and connect faith communities around the world. His ministry experience varies from a 10-week stint working alongside Mother Teresa in Calcutta to a year spent serving a wealthy mega-congregation at Willow Creek Community Church outside Chicago. The bestselling author of several books, including “The Irresistible Revolution: Living as an Ordinary Radical” and “Jesus for President: Politics for Ordinary Radicals,” Claiborne’s work has appeared in the Wall Street Journal, on CNN and National Public Radio, among other outlets. Sales of Claiborne’s books and a book signing will follow each discussion. “Executing Grace in Georgia” is sponsored by Candler’s Social Concerns Network, the Candler Coordinating Council (C3), Candler’s James T. and Berta R. Laney Legacy in Moral Leadership, and Emory University’s Center for the Study of Law and Religion, in cooperation with the McAfee School of Theology of Mercer University, Columbia Theological Seminary, Faith in Public Life, Georgians for Alternatives to the Death Penalty (GFADP) and the Southern Center for Human Rights.